Note: I was first thinking about making it a longer post, but then re-read this post by Nick Restifo and realized that he made already most of my points (btw: @itsastat is a great Twitter handle). So I'll keep it in short form. for the last week, I was playing around with data scraping and visualization. In my opinion, the use of clustering and heatmaps is a great but underused way to get a first impression and overview of data. Especially, as there are no numbers needed to understand the results (yes, I'm looking at you Chuckster!). One player receives the ball in a more or less neutral position and tries to get into an advantageous position. It is really hard to prevent the initiation of these plays. This separation is important to understand the basketball side of the analysis. You can hardly avoid for a team to initiate the Pick and Roll, but you can decide if you want to risk keeping the ball in the ball handlers hands (and giving him whatever he gets) or if you want to force the ball out of his hands and risk a spot up shot, or the Roll Man or another cutter to beat you. I will now show you a plot that will blow your mind. Are you ready Chuck?! No worries, I will explain them directly afterwards (click to enlarge). What you can see here by playtype is differences in 1. Points per possession for team offenses by plays and 2. play frequency for team defenses. 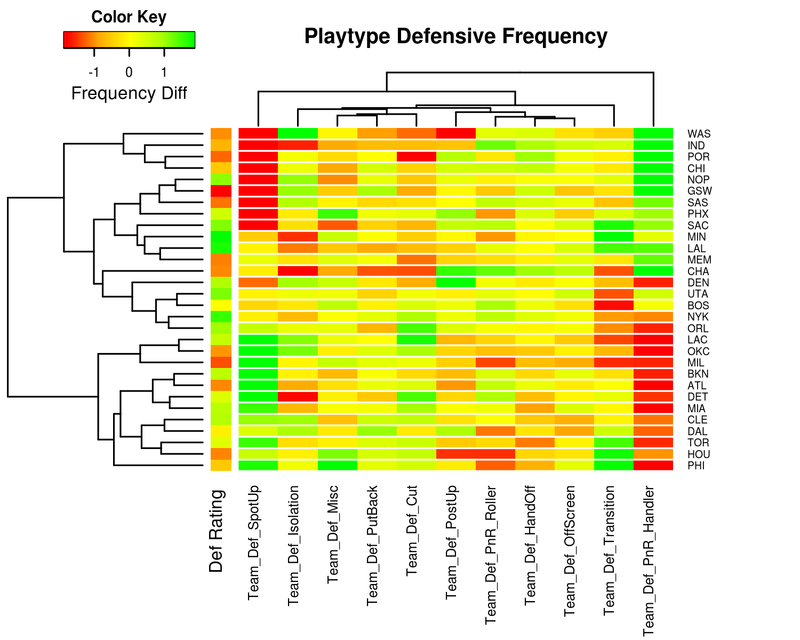 I normalized the plots by subtracting the PPP or respective frequency means for each play. 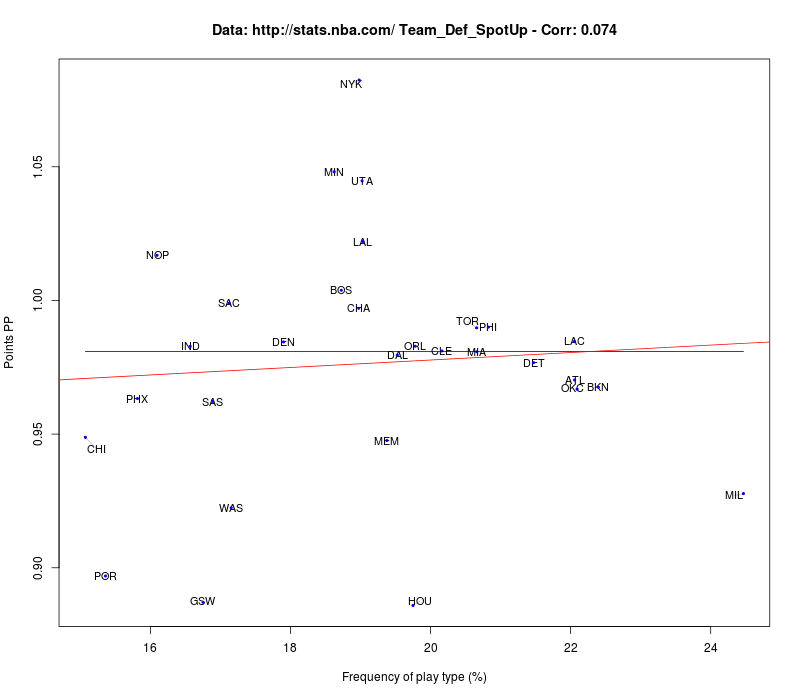 The first column shows you the offensive respectively defensive ratings of the different teams. For Off Rating & Points per possession, green means good. So, here you find almost all the good teams in the lower half. As you can see, these teams are all above average in points per possession for PnR Roller. BUT you can furthermore see that those teams that are not as good in offensive net rating (Toronto, Orlando, Boston and (up to now) San Antonio) do not produce as good with their ball handlers. Furthermore, these teams are mostly good at HandOff and SpotUp shooting (as noted by Nick). Off course this is a chicken egg problem, as good SpotUp shooter allow for easier rim attack and Handjobs are basically more fancy pick and rolls (just wanted to check if you are still awake). ALMOST: Of course, what I described here is not Houston Rockets science and teams know all this (interestingly, the Rockets seem to disagree with my points). On the one hand a defense if of course bound by its personnel. On the other hand, it is interesting to note that increased frequency of PnR Handler plays strongly correlates with increased points per possession for these plays. At the same time, decreased frequency of Spot up shots, does not lead to that much of a decrease in PPP efficiency (Figures below). So, from a game theory perspective, you surely reach a breaking point, where transform a pick and roll into a layup line is not helpful (duh). 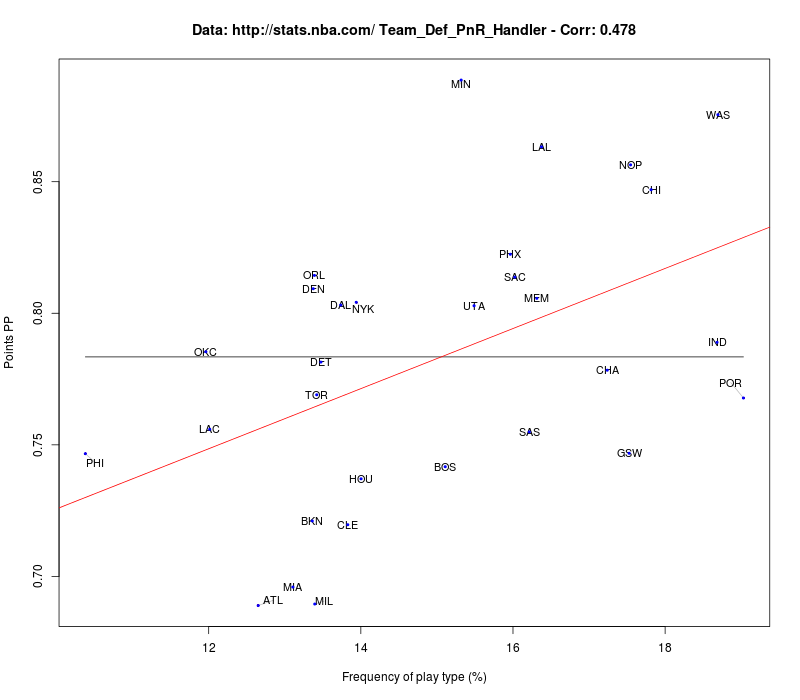 Frequency vs PPP PnR Handler: There seem to be two groups (over and under the red line). You should probably be worried if you are above this line. 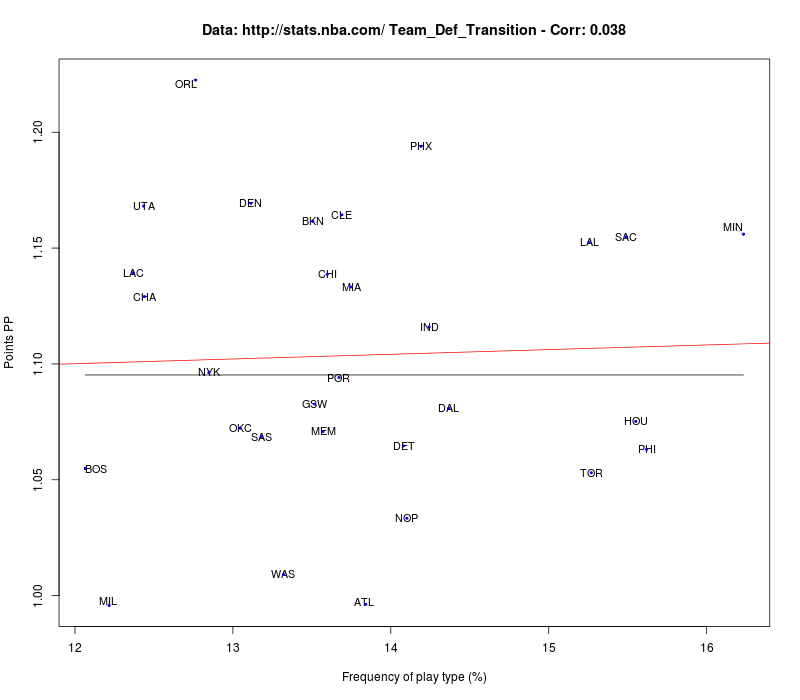 Frequency vs PPP: If somebody knows the difference between LAL/SAC/MIN and HOU/PHI/TOR transition D: I'm listening. 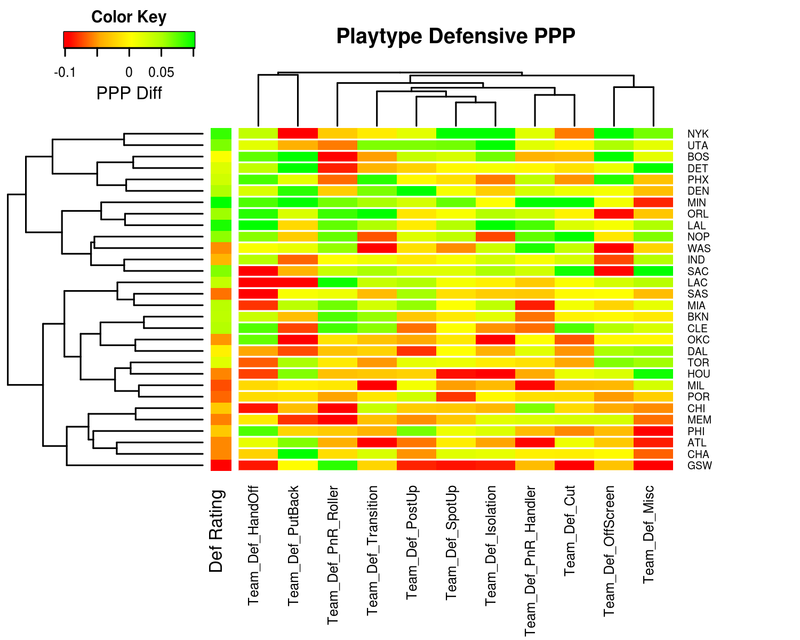 Defensive PPP for different play types. If you find anything of interest let me know. Golden State does not defend the roller very well, but is killer in everything else. 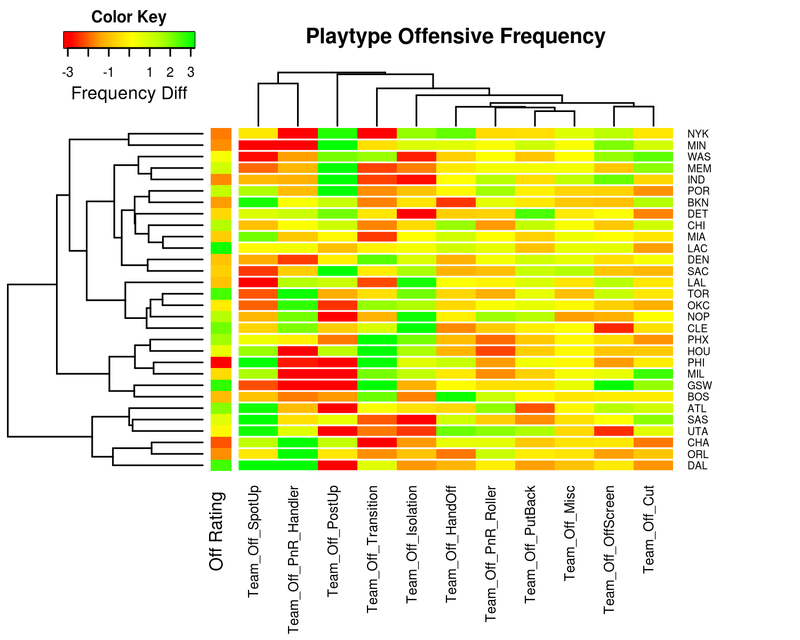 Offensive Frequency for different play types. Also no rhyme nor reason (in my opinion). I guess it's partly your style/preference, partly what the defense dictates.